A delightful app to help instil a love of numbers in the very young. This app has received an EAS Certification of 5 Stars. Hello Numbers is a simple little app that introduces young children to the numbers zero to nine in a compelling and age appropriate way. Whereas the very idea of numbers and mathematical thinking can be off-putting to children, this app helps redress this view and make numbers cuddly and welcoming. From an educational perspective it is very reassuring to see the number zero introducing the app and playing a key role, since all too often children start learning about numbers only from one to nine, and then struggle to fit the incredibly important concept of zero into their internal number lines as necessary. The clear format of the app involves a brief introduction, followed by the chance to select numbers individually to find out more. 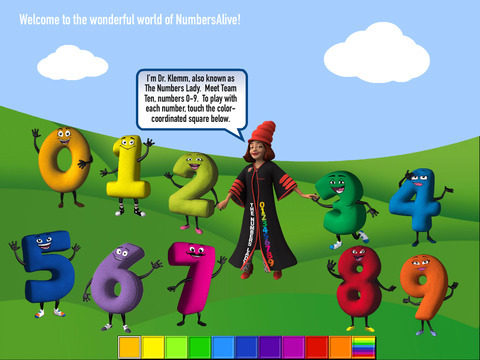 Each number has a little rhyme and an action for the child to complete on the screen, each relevant to the number in question. Although simple, it has definite replay value for the intended age group, and children will enjoy getting to know each number's rhyme and characteristics. There is also a chance to play with all the numbers together in the last activity, and some supporting information for parents who want further ideas on using the app. 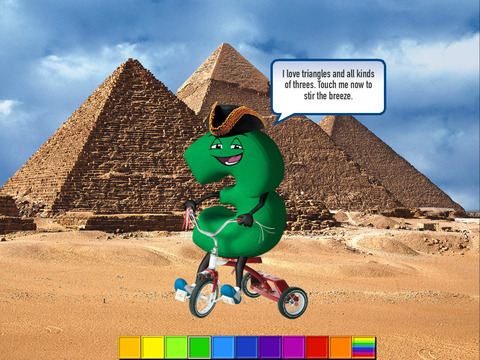 This early learning app introduces children to number knowledge in an exciting and novel way. The playful features enchant them into an imaginative romp, teaching that numbers are delightful, friendly characters relevant to the real world. They come away from this richly layered app recognizing numbers as their friends. This app accompanies the book Hello Numbers, published in 2014. The book includes stickers and a physical decoder in the shape of Zero that allows children to uncover surprises hidden under numeric patterns. The physical decoder will do the same for the coded items in this app. If you do not have a copy of the physical book, then the coded features can be turned off. Parents: check out the parent guide on the last page of the app.